Flexing allows small pieces to get caught, which is dangerous and uncomfortable. There is no dado stack ability. While I can’t really do anything about not being able to add a dado stack, or at least I haven’t figured out anything yet, I did think of adding a steel band to the zero-clearance insert to keep it from flexing at the end. I do get some comments and questions about this insert though; sometimes people don’t understand why I couldn’t have used a more conventional approach, so I’ll try to some it up. The main problem with a conventional insert, in other words an insert that doesn’t accommodate the riving knife, is that it would require me to remove the riving knife every time I wanted to use the zero-clearance insert. Some have said “That’s no big deal, when you need zero-clearance (when cutting very small pieces), you don’t need the riving knife.” While that’s true, having the riving knife there while cutting small pieces won’t hurt. So I say, if I can skip the extra step of removing and adding the riving knife every time I have to switch from cutting a small piece to a larger piece, I’ll gladly do so. The next idea that’s brought up is just leaving the bit of wood connected at the end, so it wraps around the riving knife and removes the flex from the insert. While this will work on some saws, it won’t work (or at least it probably won’t work for very long) on the DeWalt 74xx series of saws because there is less than an 1/8″ of gap between the riving knife and the slot wall. So that leaves very little room for material back there to bridge a connection between the two sides of the insert. 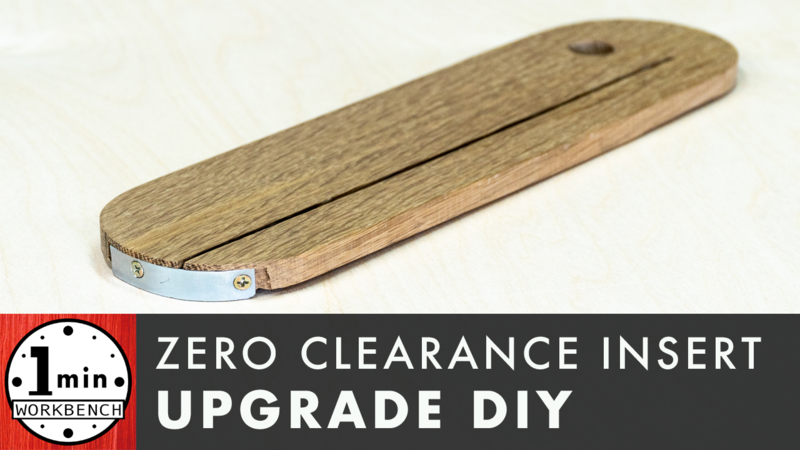 Using a small steel strap, even only .060″ thick is much stronger than leaving somewhere around .080″ to .090″ of wood back there, and will last MUCH longer. Use hot glue to more easily set the depth of the insert flush with the table. Add set screws to the insert to control the depth, just like the original. Add a threaded hole to one of the tabs that support the insert, and add a lock screw to keep the insert from coming out on accident. Use MDF for future inserts because it’s stable, easy & cheap to replace, and easy & cheap to make multiple versions for different cutting scenarios. Use plywood; for similar reasons as MDF…it’s not quite as cheap, but still pretty inexpensive and has a lot of the same good stuff going on for it. So if you have a saw that has a couple of inches between the riving knife and the slot wall, you can achieve the same (non-flexing) results by just leaving some wood back there, but if your saw is limited on space like the DeWalt 74x series saws are, then you can use a method like this, and maybe pickup some benefit from the suggestions above. You might even think of your own! If you do, be sure to share what you come up with! I think the video pretty much says it all for this one, but it has sparked a lot of interesting conversation. Some say that sprinkling a little salt into the glue will provide enough slip resistance for adding screws, which will save the step of firing nails. Others say they’ve read reports on how salt can negatively affect the chemistry of the glue and weaken the joint. And yet others have suggested using A LOT less glue, so that it no longer acts like a lubricant, or using a different type of glue (some swear by Gorilla Glue having an “instant tack”). So what’s the real answer? I guess there’s probably a little bit of merit to all of the ideas. Does salt stop slippage? Probably, but probably not as well as nails. Does salt affect the chemistry of the glue? Probably, but probably not enough to make a significant difference; if it goes from being able to hold (as an example) 500psi down to 450psi it probably isn’t going to make or break most projects. 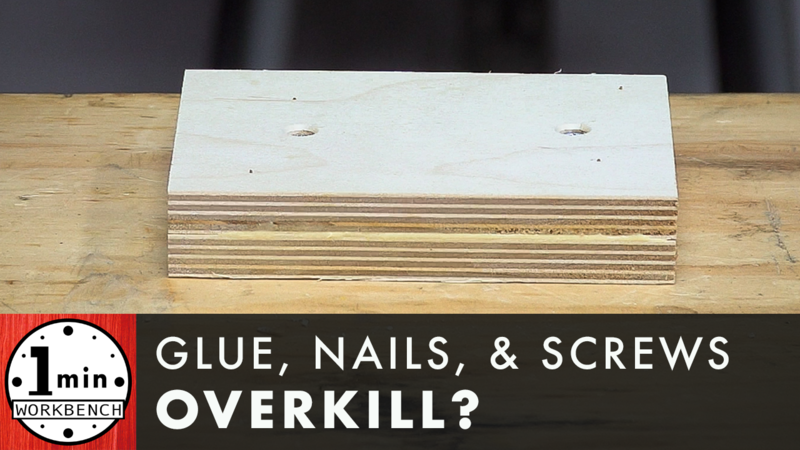 Does using less glue stop slippage? Probably, but it won’t hold the pieces together like nails do, which make it easier to move an assembly around in a pre-clamp or pre-screwed state. Does using Gorilla glue provide better “instant tack” than yellow glue? If people are saying it does, then it probably does. But is it enough to be better than nails? Probably not, but it might be a good option if nails aren’t okay for the project (you don’t want to see even the smallest nailhead in a beautiful mahogany dresser). So I still think nails are a great option because of how fast they are, and how they keep the project together, BUT this ONLY works if nails are acceptable. So all the other suggestions are great ideas for when nails are not acceptable. Gorilla glue with better tack? Bring it on! A little bit of salt to help control things? Sure! Which brings me to my last point: There are a lot of different ways to go about making joints, and I think it’s awesome that this video has inspired so many people to share what they believe is the best way of going about it. Not every method is right for every situation, and some are only right for very specific situations. The more we share are methods with each other, the more options we’ll be aware of the next time we have to make a joint, and the more we’ll be able to pick a method that suits the project. Thanks to everyone who gave feedback in the YouTube comments and shared their ideas and methods! Okay, I know what you’re thinking. This thing is useless. And….you’re right. Sort of. I find it to be somewhat entertaining to use, and because it has entertainment value, I guess that means it’s not completely useless. 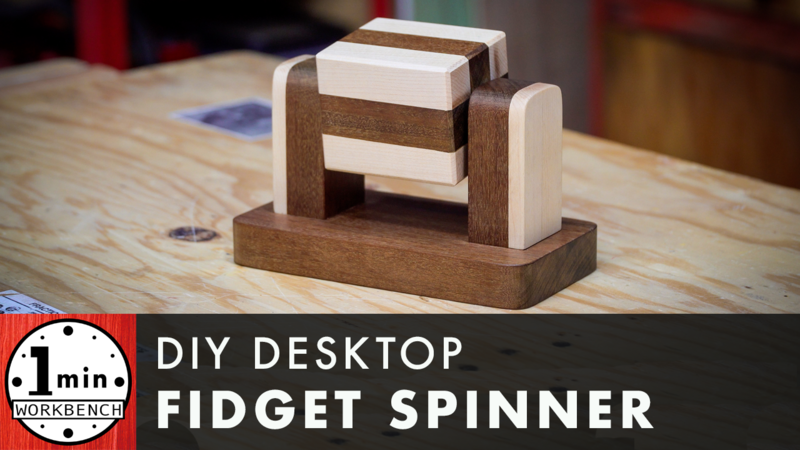 It came about because I had a prototype on my desk of a small component that had a bearing in it, and I kept sticking it to the end of a pencil an spinning it around. A friend was at the house one day and saw that and said, “dude, you should built a giant, desktop version of something like that…”. And so this thing was born. After I built it, I showed it to a few friends, and they all looked at me like I had a third eyeball in the middle of my forehead. Even the guy that gave me the idea. I showed it to him and he looked at me like I had lost my mind. Anyway, a few days later, another friend of mine called me and said, “Hey man, I just saw the fidget spinner video! That thing is awesome!” So I gave it to him as a Christmas gift, and he was thrilled. So is this thing useless? I guess it depends on who you’re building it for! If you’ve watched my channel for a while, you’ve probably noticed my planer sitting on the box it came in for a long time. You’ve probably also thought it was about time I make a home for that thing. I couldn’t agree with you more. It’s been driving me nuts having to drag the box out to use the planer, and it’s been an eyesore in my garage. As mentioned in the video, I was going to make a regular mobile cart for it, just like I did the jointer, but it never seemed right. It seemed like something was missing. What was missing was the integration of multiple processes into one time saving, space saving unit. That’s what One Minute Workbench is all about. It’s about being able to setup and tear down quickly, all while taking up as little space as possible. The idea of having two separate carts seems like a good idea at first because I could reduce use of floor space, but I missing the key ingredient of integration. Integration, or at least the right kind of integration, maximizes that reduction in floor space use, and maximizes efficiency. I say “the right kind of integration” because I often see integration methods that require too much compromise. I’ve seen a couple of “flip top” designs that are okay, but for the most part, I’m not a fan of them. There’s always something funny going on with how the cords fit into the arrangement, there’s questions about the security and stability of the locking mechanisms (introducing possible vibrations or just a general “isn’t solid” sort of feeling), the out-feeds are in competition with each other, and most importantly, you can’t easily or quickly jump back and forth from machine to machine. There will always be an additional setup process in-between machine uses. Some people have argued that I should have used blast gates for the board milling station’s dust collection system because swapping hoses is an extra setup process. While it’s true that swapping hoses is an extra step, it only takes a few seconds…literally less than 5. If you had blast gates, you’d still have to open and close blast gates, which would take the same 3-4 seconds. Blast gates are also notorious for being leaky or prone to the gates accumulating dust build up that prevents the gates from closing fully, which greatly reduces the efficiency of your vacuum. Blast gates are also expensive! So why would you pay more for something that doesn’t do as good of a job and still requires the same amount of setup time? If you’re like me, you wouldn’t! You might also be wondering about the 3D printing I did for this project and what that means for your personal build. A viewer made a great suggestion in the comments on YouTube. He suggested that you buy PVC fittings that are close to the sizes you want, and then use a heat gun to heat them up and shape them to size (by inserting them into the ports), being sure to wear protective gloves and a respirator, of course. While I haven’t tried this method myself, I have heated and formed plastic before, and it sounds viable. If you decided to build one of these, be sure to let me know how it goes and send pics so I can add them to the customer gallery. And if you’re thinking about buying the plans but have some questions, send me an email and I’ll get back to you as soon as I can. Until next time, I hope you have fun building something! Well, I’ve needed a track saw for a long time, and I didn’t want to spend the money on one either. The solution sounds simple; just build one! The only problem was that I hadn’t found or came up with a design that would appeal to my nature. Meaning, I hadn’t found or come up with one that was cheap, simple, easy to build, and would still perform as well as something that was complex and/or expensive. 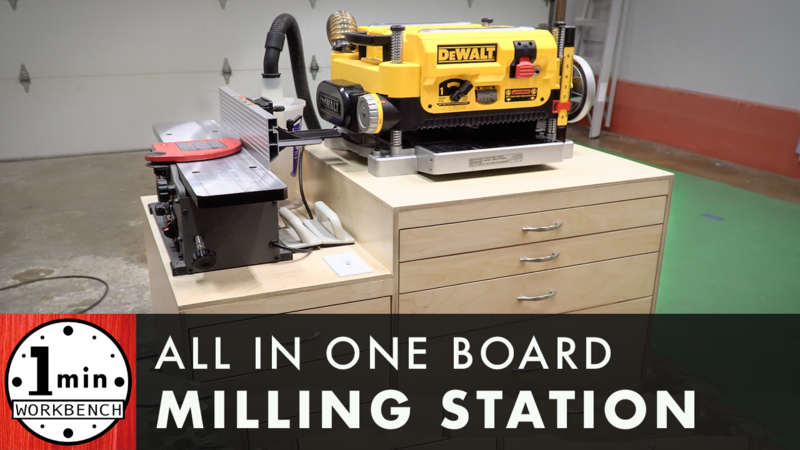 I was stuck in a situation where I couldn’t get the cut I needed for my latest “real” build (an all in one board milling station). I had cuts I needed to make from sheets of plywood, and those cuts exceeded my table saw’s fence capacity. 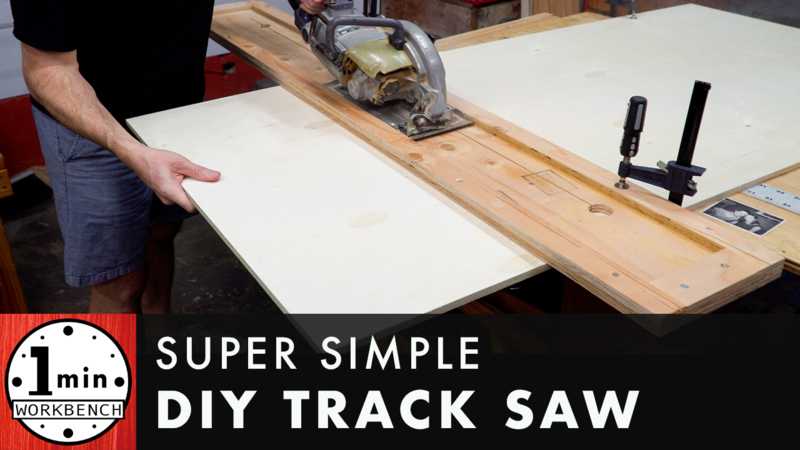 So with that pressure on, I HAD to come up with this idea pretty quickly because if I didn’t, it would have meant wasting a day or more…or going to the store to buy a track saw – not happening. They say necessity is the mother of invention, and that was certainly the case here. Even thought I had been kicking around the ideas for a long time, I never would have come up with the final design unless I needed it as badly as I did right then. I was already shooting video, and had originally just intended the track saw to be part of the board milling station video, but I figured some people might be interested in it. As it turns out, it seems like a lot of people are interested and have been wanting the same thing. So far, this video has been off to a more popular start than any project I’ve ever posted before, and by a lot. I had no idea that there was that big of a need for something like this, but I’m happy to share and hope it helps a lot of people. Buy a piece of plywood. Cut one of the factory edges off (don’t worry about the cut being crooked). Attach that strip to the sheet (with glue, screws, etc.) with the factory edge facing towards the meat of the sheet, and the crooked cut of that strip alongside the crooked cut of the sheet. Repeat that for every section of the track. Add end stops, drill holes, and cut the slot. You’re done! 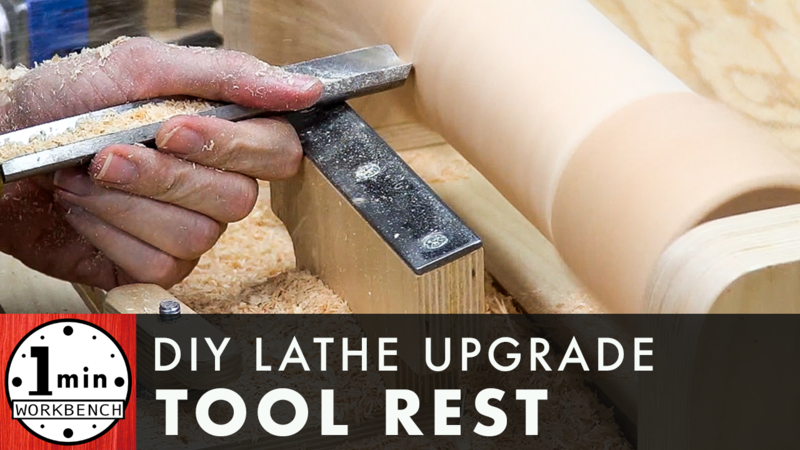 You guys wanted me to make some changes to the lathe, so here they are! I appreciate you all taking the time to let me know what improvements could be made. The most suggested change was lowering the tool rest, and the second was adding a protective strip of metal to the tool rest. These changes really made a huge improvement. I didn’t think it was that bad before, but this is way better. The chips now fly downward instead of towards my face, and the gouges now slide very nicely along the steel strip. This just makes it to where I can get a smoother more consistent line as I’m turning a piece. 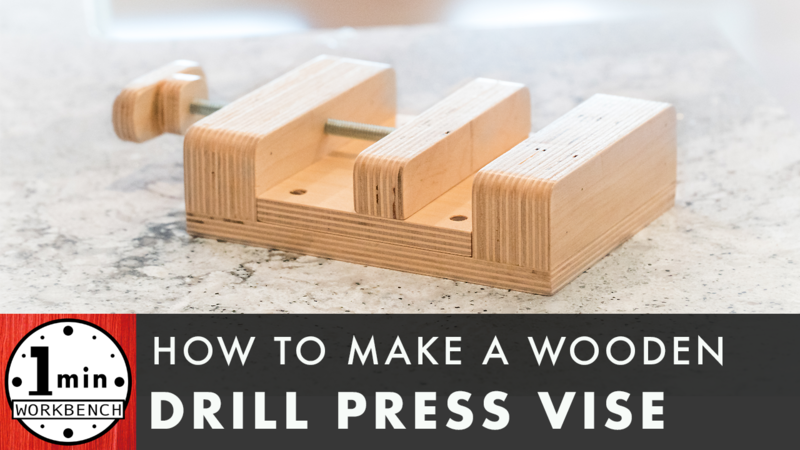 You’ve probably seen me using spring clamps to hold small parts at the drill press. What I don’t show you in those videos is that often the parts push their way out of the holding force of the spring clamp. They stick to the bit, and spin around in a menacing fashion, threatening to fly off at any moment and take out an eyeball. Luckily, I’m pretty good about wearing safety glasses (although I have been razzed pretty good in the comments for not wearing them while making a cut in my table saw sled build video). I digress. I do have a metal drill press vise, but it’s too easy to damage the parts I’m working on. Also, a normal drill press vise has an opening in the center, which prevents you from drilling into the vise itself. That’s fine for most metals, but wood benefits from having a sacrificial piece directly behind it. The sacrificial piece prevents the fibers of wood from “blowing out” or tearing out in the direction of the bit’s travel – kind of like an exit wound from a gunshot. When I drill small wooden parts, I usually poke a hole using a spike directly where I want to drill. This makes it to where the drill bit finds its way to that center point; the bit simply pulls the workpiece into the correct position. This technique is less likely to work correctly when using a metal vise because of the weight. 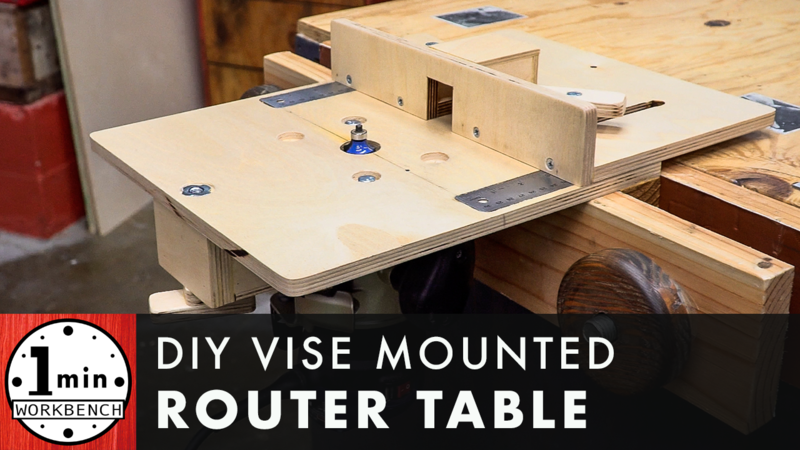 This new vise is lightweight enough to allow this trick to work. I haven’t put this vise fully through its paces yet, but I’m excited to have something that at least won’t let go of my workpieces. I’ll keep you updated on how it performs and what I learn from it! It seems like every time I build a project, I wind up doing something that would be easier if I had another tool. The last couple of projects I’d built all required me to cut metal. I have a hacksaw, and that works, but sometimes takes a while and is a lot of effort. It’s also not super accurate. So I bought an angle grinder. That was a lot better because it required less effort, but it still isn’t super accurate and sometimes feels dangerous depending on the position I’m using it in. Enter the idea of a chop saw. I don’t cut metal often enough (or large enough pieces of it) to warrant a full sized chop saw. I also don’t have a lot of room in my shop, which you probably already know. I shopped online for an angle grinder holder and almost settled on one that was fairly cheap and had good reviews. I couldn’t help but think it would probably be more bulky than I wanted because it’s designed to accommodate a wide range of grinders. I was also concerned about the position of the power switch. The switch is designed to be pushed forward, not pulled towards you. It just seemed dangerous and uncomfortable. So I settled on building one. 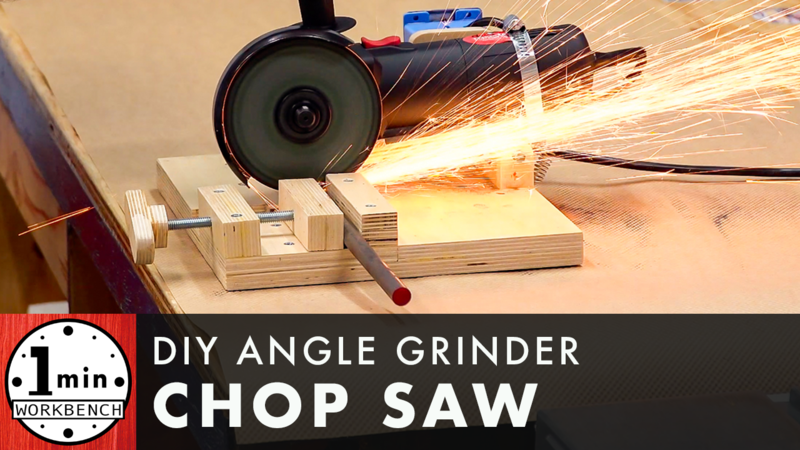 With building my own, I could make it as streamlined as possible for my specific grinder (a very cheap – $15 – grinder from Harbor Freight). Building my own also allowed me to add a power switch where it was most comfortable. I’m pretty happy with the chop saw. It’s not going to be a star tool for a daily metal worker, but sure beats a hacksaw for a woodworker that occasionally needs to cut some metal! Okay, so this was a tough build. I take that back – the build was easy! The hard part was getting the design right. 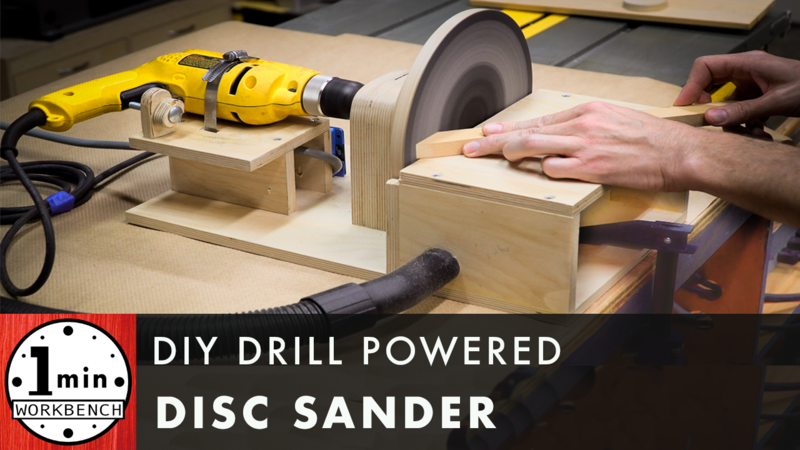 I saw a lot of designs on the internet for drill powered disc sanders, even some on YouTube, but I’m going to go out on a limb here and guess that most of those designs failed shortly after they posted the video. How can I be so sure? Because I tried and tested designs similar to everything I’ve seen, and all of them failed after 10-20 minutes or so of use. Which is why I’ve been at this project for over a month now – I didn’t feel right about posting a video of something that was only going to last 10 minutes. I tried a bolt/threaded rod as the spindle (I’m sure you’ve seen a similar video), which by the way created way too much wobble, and was not comfortable to use. You’ve probably seen YouTube videos of people using wobbly sanders. From the video, it might not look like that big of deal, but trust me – it is. I tried truing the face with a chisel with only mediocre results. Because the spindle can’t be set at 90 degrees to the disc, truing the disc is like spitting in the wind. I tried to use hex nuts or bolt heads that fit into a shape that has been chiseled out in one plate while another plate with a counterbore covers it (I’m sure you’ve seen a similar video on YouTube). It failed very quickly. The head of the bolt/hex nut would tear through the wood after using it for a short time. I tried reinforcing things with 5 min epoxy. That also failed…just a took a little bit longer. I tried using marine grade epoxy. In fairness, it held up for more than 20 minutes, but eventually shattered during light use because it was too brittle, too “glass-like”. In the end, I’ve performed over 5 epoxy tests, built 3 sanders, and have made 5 disc designs for the last iteration of the sander. So what’s the disc and joint design that’s currently winning? A non-threaded 5/16 plain steel rod, and old school JB Weld. Original formula. The non-threaded rod is a much better fit for the bearings, and using the method I did, I was able to get it dead straight at 90 degrees to the disc. Not only was I able to get it straight, I was able to easily repeat my success – every disc I’ve built since coming up with this method has been easy to set at 90 degrees to the spindle. And the JB weld is as hard as marine grade epoxy, but not as brittle. You can watch the video here to see how I implemented it. And how is it holding up? I sanded a large piece of southern yellow pine today for 40 minutes straight, turning the machine on and off at random times to simulate using it in real world conditions where the spindle/epoxy joint will be under start and stop torque conditions. I sanded for intervals upwards of 10 minutes straight, would flip it off, flip it on, and go right back to sanding. After all that, I turned it on and off 110 times, letting it come to a full stop between so that it had to suffer maximum torque at start-up. The spindle and disc have zero play. I’m pretty happy! If you want to be happy with one of these too, you can buy the plans here!